The second in the series proposed for Huffington Post ( India ) by Sri M, that has been published here. Huffington Post India is the Indian edition of the The Huffington Post, an American online news aggregator and blog founded by Arianna Huffington, Kenneth Lerer, Andrew Breitbart, and Jonah Peretti, featuring columnists. The site offers news, blogs, and original content and covers politics, business, entertainment, environment, technology, popular media, lifestyle, culture, comedy, healthy living, women’s interests, and local news. The regular column will feature Sri M’s articles online. In the early hours of 12 January 2015, I stood at the land’s end of peninsular India — Kanyakumari. To be precise, I was at the Triveni Sangam, the confluence of the three seas: the Indian Ocean, Arabian Sea and Bay of Bengal. In that awe-inspiring setting — as the early sun left a trail of orange, the sea breeze gained a gentle turbulence and the turquoise water lapped at my feet — my thoughts harked back in time. In 1892, the great prophet of interfaith harmony, Swami Vivekananda had swum across the sea at this point to a nearby rock, known today by his name, and meditated to find enlightenment on his life’s mission. The seer’s mission hinged on rousing a nation from its dismal slumber and rediscovering its past glory. 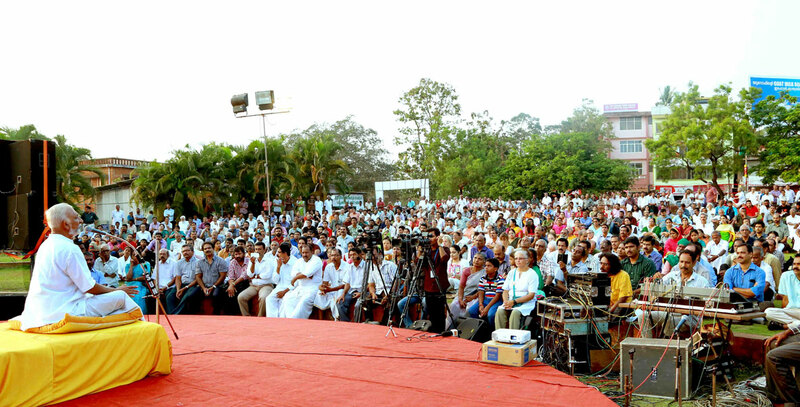 Consequently, Swami Vivekananda wandered the length and breadth of India with his message of peace and oneness. His core philosophy extolled the spark of the divine present deep inside every human being. It did not matter whether one was born rich or poor, as a man or woman, or belonged to this faith or that; the spark of the divine was intrinsic to everyone. This realisation that the Truth is one opens up an opportunity for us to be united, despite our differences. All rivers, though they originate in different places and run through different regions, flow finally into the mighty ocean, merging with that overwhelming immensity, the source of all life. The spiritual journey is also similar — paths are different but we all have to travel towards the one Ultimate Truth. Guided by this thought, we collected the waters of the Triveni Sangam to consecrate the Walk of Hope — anticipating that its unifying symbolism would end all divisive ideas of strife and violence. Not too far from the Rock, is the Gandhi Mandapam–the memorial to the great apostle of peace and non-violence, Mahatma Gandhi. We paid floral respects at the memorial, seeking inspiration and strength to complete this endeavor that seeks to unify India while securing its diversity of faith and culture. At the height of the Indian freedom struggle, Mahatma Gandhi had perfected the non-violent modes of Satyagraha (search for truth) and Padayatra (journey on foot) to peacefully claim the nation’s right to independence and self-determination. 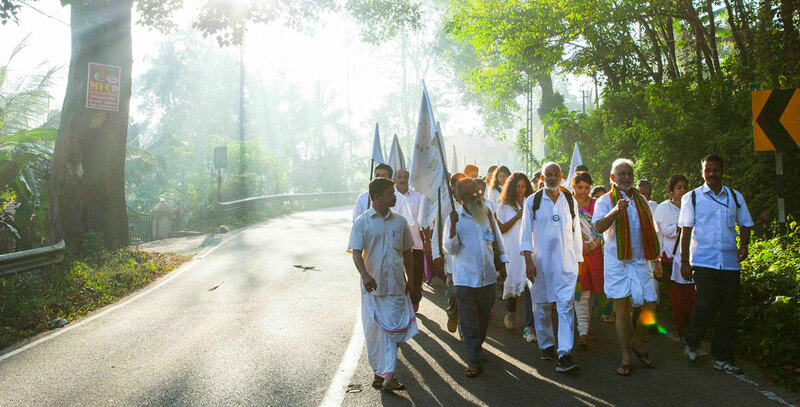 The Padayatra is purposeful in intent yet soulful in execution — in essence, a walking pilgrimage. For centuries, seers and saints in India have used the concept to reach out to the society — the innumerable towns and villages — to spread awareness of their message. The Walk of Hope is powered by this concept with the imminent hope that a single act of good purpose will catalyse a chain-reaction, leading to a better world and a better tomorrow. The precise point in Kanyakumari, from where the 500-day Walk of Hope was flagged off, is known officially as the Zero Point. I reminded my fellow padayatris, at the onset, that this is where we start with our egos reduced to zero. If one begins with the thought that one knows everything, one doesn’t learn anything more because an overflowing cup can take no more. Space is required for the divine truth to manifest within and for that the ego has to be annihilated. We must start from this smaller zero in order to reach the larger zero, the Shunya — the Supreme Being. 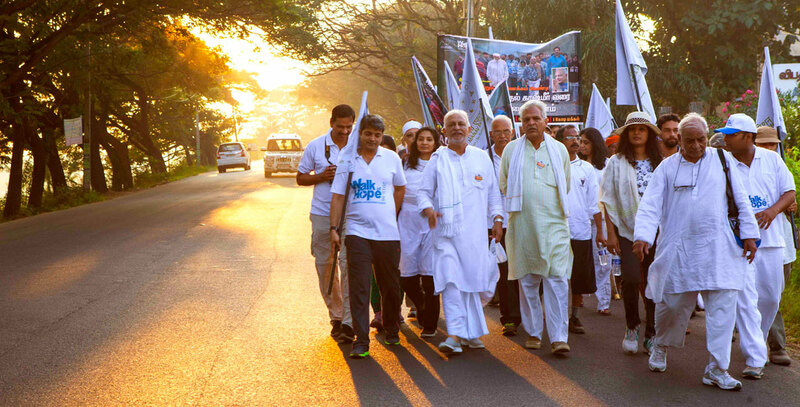 The Walk of Hope is not just about me; all the padayatris have an equally important role to play in this nation-building initiative. Raising awareness towards this great cause is a collective responsibility of all of us. I believe people everywhere are generally predisposed to peace and harmony and the Walk seeks to manifest this within 10 million people along its route — inspiring acceptance, reconciliation and respect for diversity in each individual. Compassion is another redeeming quality of humanity that the Walk seeks to manifest. I am reminded of what my Master, Maheshwarnath Babaji, once told me on the banks of the Ganges: “Thirteen years of meditation for thirteen hours a day is a colossal waste if you cannot truly hear a child’s cry of hunger.” In what was then a revelatory message to me, he concisely conveyed the importance of compassion in one’s life, placing it much above any spiritual practice of sorts. Translated, it says, “One who has control over his sense organs, is equally disposed to all and has the welfare of all beings at heart is the ideal devotee.” Discipline, equality and compassion are key to the Walk of Hope, for it is also an inner journey, a transformative endeavour. Scriptures of all our faiths, without exception, state the relevance of mercy and compassion. The prayer of a Muslim resonates with these two words–Raḥīm (merciful) and Raḥmān (compassionate). A true human being is able to put other’s needs ahead of his. This compassionate understanding is also synonymous with nature’s core interconnectedness. If all human beings demonstrate mercy and compassion to everyone else, then there is no greater way to get closer to Manav Ekta –the oneness of humanity.